Communication through language, irrespective of the model of its structure and deployment, entails the making of meanings. The ways that advertisers produce meaning through disjunctive grammar is the concern of this study. Thus, the analysis considered twelve advertisements for examination for meaning deductions. The Hallidayan ‘below the clause’ was the conceptual facilitator of meanings in texts. With the application of technological tools of the table and graph, the study drew a conclusion that nominal group (NG) is the most employed device to fascinate readers to consumption. Having observed that advertisers utilize health matters, beliefs and values, monetary gifts, contents of commodities, etc. 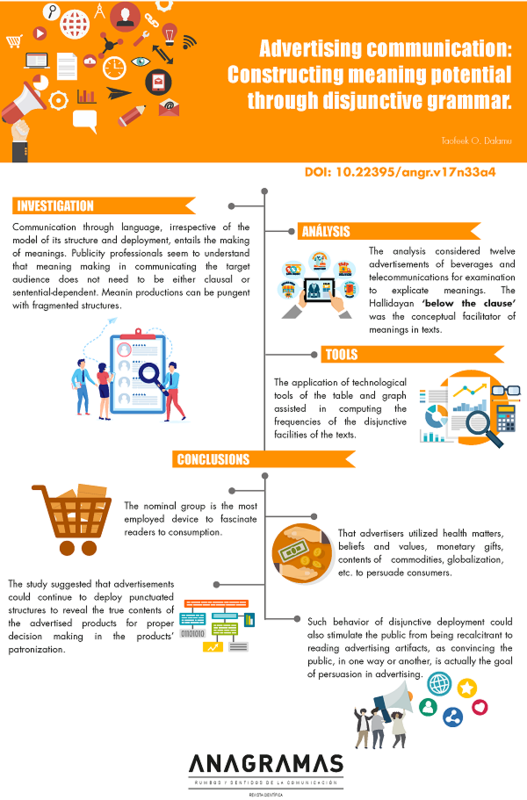 to persuade consumers, the study suggests that advertisements could assist in revealing the true contents of the advertised products for proper decision making on the products to patronize. Such behavior could also sensitize the public from being recalcitrant to reading advertising artifacts which is a gain to advertisers themselves. Barthes, R. (1968). Elements of semiology. New York: Hill Wang. Berlo, D. K. (1960). The process of communication: An introduction to theory and practice. New York: Holt, Rinehart and Winston. Bittner, J. (1989). Mass communication: an introduction. New Jersey: Prentice-Hall, Inc.
Bloor, T. & Bloor, M. (2013). The functional analysis of English. Abingdon, Oxon: Routledge. Brierley, S. (1995). The advertising handbook. London: Routledge. Brownell, J. (2009). Listening: Attitudes, principles, and skills. Boston, MA: Pearson. Carter, R. & Nash, W. (1990). Seeing through language. Lexington, KY: Blackwell. Cheney, G. (2011). Organizational communication in an age of globalization: Issues, reflections, practices. Long Grove, IL: Waveland Press. Cook, G. (2001). The discourse of advertising. New York: Routledge. Crystal, D. (1998). Language play. Chicago: University of Chicago Press. Dominck, J. R. (2005). The dynamics of mass communication: Media in the digital age. Boston: McGraw-Hill. (ed. ), Marketing and semiotics: New directions in the study of signs for sales. Berlin: Mouton de Gruyter, 295-318. Dyer, G. (2005). Advertising as communication. London: Routledge. Edell, J. & Staeling, R. (1983). The information processing of pictures in print advertisements. Journal of Consumer Research, 10, 45-61. Eggins, S. (2004). Introduction to systemic functional linguistics. London: Continuum. Eisenberg, E. M. (2010). Organizational communication: Balancing creativity and constraint. New York, NY: Saint Martin’s. Ewen, Stuart 91976). Captains of consciousness: Advertising and the social root of consumer culture. New York: McGraw-Hill. Fairclough, N. (2001). Language and power. Harlow, England: Pearson Education. FDA (nd). Understanding cholesterol: The good, the bad, and the necessary. Center for Drug Evaluation and Research. Harvard Health Publications. Retrieved on 15 April, 2016 from www.health.harvard.edu. Fiske, J. (1989). Understanding popular culture. London: Unwin Hyman. Forceville, C. (1996). Pictorial metaphor in advertising. London and New York:Routledge. Geis, M. L. (1982). The language of television advertising. London and New York: Academic Press. Gieszinger, S. (2001). The history of advertising language. Frankfurt: Peter Lang GmbH. Griffin, E. (2000). A first look at communication theory. New York: McGraw-Hill. Grossberg, R., Nelson, C., & Treichler, P. (ed.) (1993). Cultural studies. London: Routledge. Halliday, M.A.K., & Matthiessen M. I. M. (2004). An introduction to functional grammar. Great Britain: Hodder Arnold. Halliday, M.A.K., & Matthiessen M. I. M. (2014). Halliday’s introduction to functional grammar. Abingdon, Oxon: Routledge. Harris, R. & Seldon, A. (1962). Advertising and the public. London: Andre Deutsch. Hermeren, L. (1999). English for sale: A study of the language of advertising. Lund: Lund University Press. Hoey, M. (2001). Textual interaction: An introduction to written discourse analysis. Abingdon, Oxon: Routledge. Hybels, S. & Weaver II, R. L. (2004). Communication effectiveness. Boston: McGraw-Hill. Jakobson, R. (1960). Closing statement: Linguistics and poetics. In T. A. Sebeok (ed. ), Style in language, pp 350-377. Cambridge, Mass. : MIT Press. Kalmane, R. (2010). Advertising: Using words as tools for sellingingdom. United Kingdom: Lulu Enterprises Limited. Keyton, J. (2011). Communication and organizational culture: A key to understanding work experience. Thousand Oaks, CA: Sage Publications. Horn, E. A. (2010). Poetic organization and poetic license in the lyrics of Hank Williams, SR. and Snoop Dogg. [Ph.D Dissertation. Austin, University of Texas]. Retrieved on January 13, 2017 from https://repositories.lib.utexas.edu/bitstream/handle/2152/ETD. Leech, G. (1966). English in advertising: A linguistic study of advertising in Great Britain. London: Longman. Martin, J. R. & Rose, C. (2013). Working with discourse: Meaning beyond the clause. London and New York: Bloomsbury Academy. Matthiessen, C.I.M. (1996). Tense in English seen through Systemic Functional Theory. In Berry, M., C. Butler, R. Fawcett & G. Huang (eds. ), Meaning and Form: Systemic Functional Interpretations. Meaning and Choice in Language: Studies for Michael Halliday, in the Series Advances in Discourse Processes LVII 431-498. New Jersey: Abler Publication Company. Myers, G. (1994). Words in ads. London/New York: Arnold. Okoro, O. (2008). Exploring collocations in Nigerian English usage. In A. Daramola, and O. Olugasa (eds. ), Literature and language: A drama of life, Festschrift in honor of Z. A. Adejumo, 113-140. Lagos: BPrint. Piller, I. (1997). Englische Werbeslogans. Anglia, 115, 193-222. Roos, E. (1991). Aspects of the interpretation of puns in newspaper advertisements. In E. Feldbusch, R. Pogarell & C. Weiß (eds. ), Neue fragen der linguistic akten des 25. Linguistischen Kolloquiums, Paderborn 1990, 2, Innovation und Anwendung. Turbingen: Niemeyer, 439-446. Shakespeare, Williams (2003). Hamlet. New York: Simon & Schuster. Stubbs, Michael (1996). Text and corpus analysis: Computer-assisted studies of language and culture. Oxford: Blackwell. Summers, D. C. (2010). Quality management: Creating and sustaining organizational effectiveness. Upper Saddle River, NJ: Prentice Hall. Thompson, G. (2004). Introducing functional grammar. Great Britain: Hodder Arnold. Thompson, G. (2014). Introducing functional grammar. Abingdon, Oxon: Routledge. Van Dijk, T. A. (2010). Discourse and context: A sociocognitive approach. Melbourne: Cambridge University Press. models and examples. Recent advances in financial planning and roduct development, 117-131. Retrieved on 13 June, 2016 from http://www.wseas.us/e.library/conferences/2014/Istanbul/FINANCE/FINANCE-17.pdf. Vestergaard, T. & Schroder, K. (1985). The language of advertising. Oxford and New York: Basil Blackwell. Warren, Beatrice (1988). Ambiguity and vagueness in adjectives. Studia Linguistica, 42, 122-172. Willis, Paul (1990). Common culture: Symbolic work at play in the everyday cultures of the young. Milton Keyes: Open University Press.